It's always an exciting time when we come to the end of a project. Mostly because it's one of those rare times where we're finished with something. This week we're finishing the right leg from an exceptionally big lambeosaur (crested duckbill dinosaur) that was discovered this past summer in the Judith River Formation by Dr. Kraig Derstler. 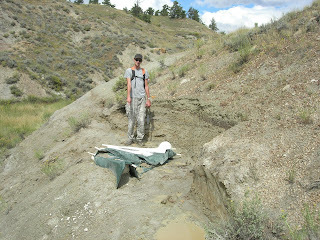 We were very excited at the time about the find since big articulated dinosaur legs usually lead to big articulated more complete dinosaurs. Usually. 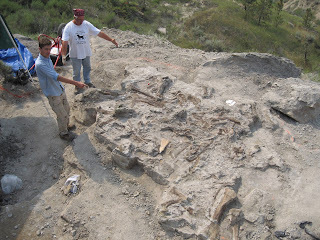 Digging revealed that it was highly likely that the entire skeleton was present at one time in the late Cretaceous, however everything but this right leg (animal was probably laying on its right side) was eroded away during the Campanian. Oh well, it stings a little less when you know you're 78 million years too late. We had help from some great ranchers and their newfangled power ATV things getting the specimen out of the bottom of the uncharacteristically wet gully. Without them, the leg would still probably be there riding out the winter. 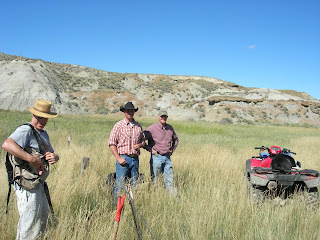 Above are ranchers Matt Wickens and Kerry Simac, with "field chef" Peter checking his gear. Below Jacob is pointing to the specimen, while rancher and dino finder extrordanaire Larry Tuss rests. I'm just sorta holding up the "outfit" as they call vehicles in Montana. A few months later this is the result. A reasonably complete prepared leg. Missing the fibula, astragulus and calcaneum due to erosion, and the ungual on digit IV. The monster is 11 feet long (3.36 meters). Biiiig. Assembly of the body of the first cast is done! Just detailing and the skull to go. Today we decided to see what it looks like with the skull on the body. Let's just say we were a bit surprised with the size of the animal that resulted. Here April and Todd do the honors! A quick update from the last post. Progress on the Terminonaris is being made on the two prototype articulated mounts. All molding except the skull is finished and all parts are poured. The first mount even has an arm! That should get people excites, since we all know people love pointy bits. Just legs, coracoids and a skull to go. Please excuse the clutter in the shop! For the past month or so we've been working hard on restoring a specimen of the extinct crocodilian Terminonaris, in collaboration with the Royal Saskatchewan Museum (RSM) in Regina. We were supplied molds of the original slightly crushed specimen, which provide the basis for our restoration. It's been a long but fun process. As of today, restoration and molding of all postcranial elements have been completed. Casts are nearly finished being poured and trimmed... now for the good part - a sneak peek. We've moved on to the exciting assembly portion of the project. Cast #1 is intended for a travelling exhibit and is being built to the exact specifications provided by the RSM. The animal is pretty dang big, at over 18 feet long. As you can see, the dorsal, sacral and caudal vertebrae are finished, the ribs and pelvis are hung and the chevrons are being attached. Nearly 100 individual elements so far! I'll be updating our progress as the projects progress. Stay tuned. Viral Post: "What Should Everyone Know about Paleontology"
Dr. Thomas Holtz, who visited our lab last year, recently shared his insights in a response to a question posted on the Dinosaur Mailing List. I muddle through their archives online a bit, and there are sometimes some good posts, but this one seems to have taken on a life of its own, being featured on SV-POW, Love in the Time of Chasmosaurs, and Superoceras so far. 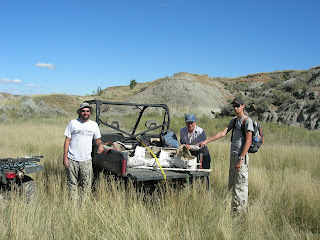 I think it warrants more exposure, so I'll chip in my contribution on teh RMDRC Paleo Lab blog. Hopefully the formatting didn't get too messed up. Also, be sure to check out the linked blogs mentioned in the post. I think that is a good question. What really are the most important elements of paleontology that the general public should understand? I took a shot at coming up with a list of key concepts (http://dml.cmnh.org/2011Feb/msg00027.html andhttp://dml.cmnh.org/2011Feb/msg00029.html), based on experiences with teaching paleontology and historical geology and with less-formally structured outreach to the public. I have offered this list (cross posted at the Superoceras andArchosaur Musings blogs) as a way for it to reach a wider audience. That this is Darwin Week makes it even more appropriate, as we should use this occasion to encourage a better understanding of the changes of Earth and Life through Time for the public at large. 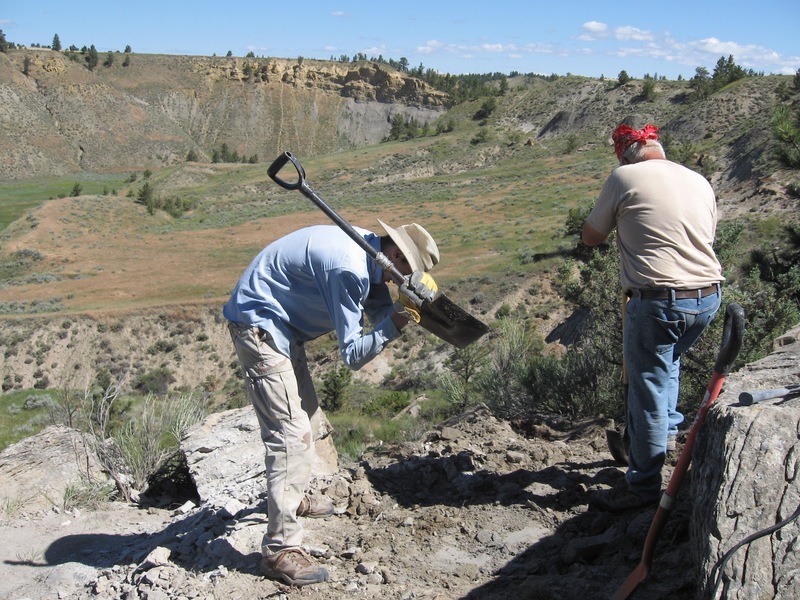 Things are moving along well in the lab this winter, and one of our long term projects that we hope to tackle soon is the removal of the huge field jacket of RMDRC 07-022 "Joyce", a medium-sized crested duckbill from the Judith River Formation of central Montana. Joyce was discovered by rancher Larry Tuss on private land leased by TPI for fossil collecting, and is named after his lovely wife. 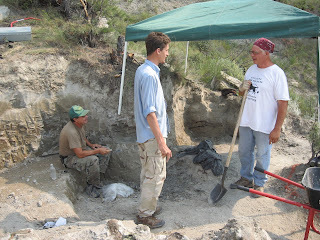 The dig was hot, and we were visited by film crews from Australian Broadcasting and NBC. The animal is moderately complete and partially articulated, however the tail was lost due to cretaceous erosion. Nothing like being 70 million years late to the party. Currently the main jacket is being re-hydrated so that the matrix can be safely removed and the bones extracted from the middle of the prep lab. Photo above is the right lower jaw and part of the upper jaw. Any duckbill guys know if it's distinctive to genus level?